Wang Anyi (������, born in Tong'an in 1954) is a Chinese writer, and currently the chairwoman of Writers' Association of Shanghai. 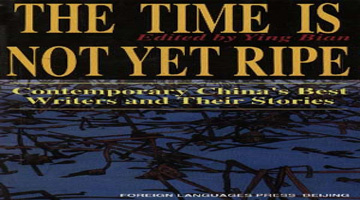 A novella and six of her stories have been translated and collected in "Lapse of Time"
The English version of this book is available now at CCC for purchase (RMB 16). Chinese writer who has in particular depicted Shanghai life. Wang Anyi represents the generation of writers whose formal education was disrupted by the Cultural Revolution. She is among the most widely read and anthologized authors of the post-Mao era, a breaker of taboos and a speaker for China's younger generation. Among Wang's acclaimed Shanghai novels is the nostalgic Changhen ge (1996). It follows the aspirations and muted sufferings of a beauty pageant winner, from 1940s Shanghai through the political storms of China.